Derek McInnes was keen to sign Jason Naismith from Ross County. 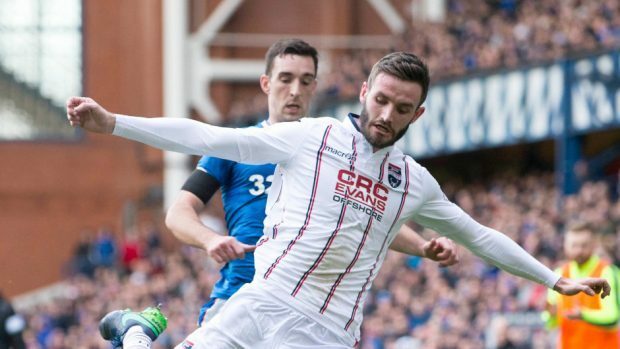 Ross County defender Jason Naismith aims to silence a number of his friends in the home end by helping the Staggies claim their first win at Ibrox today. Paisley-born Naismith grew up a Rangers supporter, with most of his friends continuing to follow the Light Blues. The boot will be on the other foot for Naismith this afternoon however, with the County right back making the trip to Glasgow optimistic he can help his side claim a memorable victory. Naismith said: “I’ll have plenty friends at the game – most in the Rangers end. My friends sit next to the away dug-out, so they said they would give me a bit of stick but I’ll not be listening anyway. “When it comes to us it’s just professional. There’s nothing more that I would love than to go there and turn them over. “We’ve all got a point to prove – I certainly feel I have anyway – after last week’s 2-0 defeat against Dundee. “We will be looking to get three points there. “I don’t think we feel like underdogs now, maybe in years gone by. “Rangers have got a fantastic crowd behind them, and I think that helps them. “But I don’t think we have to fear anything. Looking at the last couple of years and this season even. “Sometimes Rangers are vulnerable – every team is. “I don’t think we can go there with any belief they are any better than us. Despite moving into second place with back-to-back victories against Aberdeen, Rangers have faced a turbulent week after Dons boss Derek McInnes – their first choice target to replace the sacked Pedro Caixinha – committed his future to Pittodrie. Interim manager Graeme Murty will continue to take charge into the new year. Former St Mirren defender Naismith does not reckon the chaotic situation will affect the Gers players, adding: “I don’t think their situation plays into our hands. “I don’t think the Rangers players will be that affected by it. “As professionals, they will be going out and trying to get results. Their situation won’t come into our thinking too much. “We will just be concentrating on ourselves. “If it helps us in any way then good, but I think you see with their performance last week they have turned over Aberdeen pretty convincingly in the two games. “It doesn’t look as if it’s affecting them. “Graeme Murty has done a good job in the last week as they have changed their shape a wee bit.